The 2017 AIEA Annual Conference focuses on the interplay between boundaries and connections in internationalization. In an era of resource constraints, many well-meaning institutions are struggling to support international student inclusion and success. 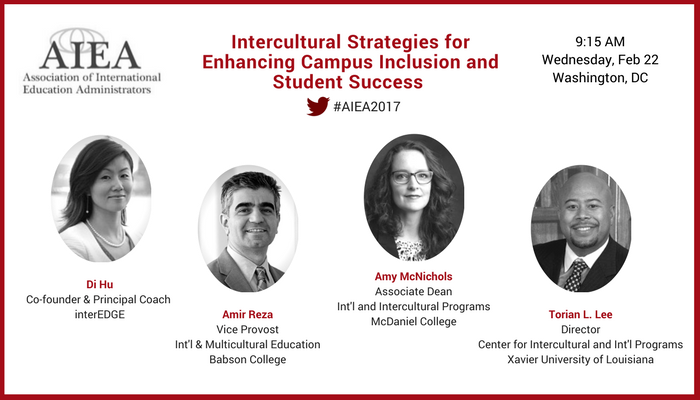 At the AIEA 2017 conference in Washington, DC, Di Hu, co-founder of interEDGE, chaired a session entitled “Intercultural Strategies for Enhancing Campus Inclusion and Student Success.” This interactive session brought together Senior International Officers from diverse institutional contexts to share their leadership perspectives and experiences in developing and implementing applying cost-effective, high-impact intercultural strategies to enhance intercultural competence for all student groups including international students. What is the role of intercultural competence in shaping international student success and experience? What are the key strategies (programs/practices) in achieving optimal outcomes? Stay tuned for a summary article. Leave us a comment with your question about the topic.